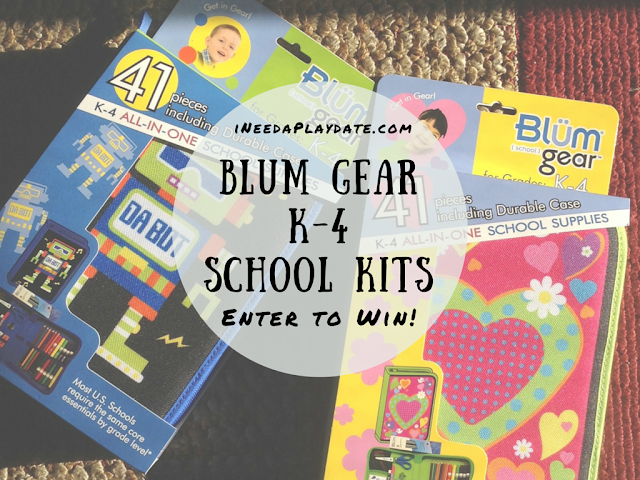 Back to School with @BlumGear Kits + Enter to Win! Products were given to facilitate this review and sweepstakes. Opinions are my own. Affiliate links are present. Back to school shopping is a chore. Sure, it may be exciting at first which is great to get the kids excited about going to school but it's still a chore. Even more so for parents of left-handed kids who struggle to find scissors that their kids can use. Blüm, a leading manufacturer of premium arts, crafts, and school supplies, understands this and has done the shopping for us. They have done extensive research into what most schools have on their supply list and created a kit. Rugged and Colorful Poly Fabric Cases, Pre-Loaded with 80% of the items found on most back to school Lists. Total number of pieces. 41. All of the core essentials for grades K-4. Helps students keep their supplies organized in these decorative and durable cases. There isn't a whole lot this kit is missing! All of this in a durable and fun carrying case! Both of my kids are lefties so purchasing a kit like this usually means that I get to keep the scissors but for once, a company has a pair of scissors that cuts both ways, so to speak. Both kids were able to use them without any trouble. Sadly, our school will not allow the kids to bring this to class but this doesn't mean that it won't be used! I love how everything has its place and that all the markers and colored pencils are dual sided to conserve space. This is the perfect set to have at home for homework. I can't tell you how many times last year I ended up stopping off at the store to buy a whole package or box of one of these items for home because it was needed to complete a homework assignment. This year there is no reason to hunt for anything since it is neatly organized and zipped away safely. Blüm has made it easy to keep supplies neat, organized, and for the right price. This is not just great for school but also for homeschoolers and for on the go. My little one has been carrying her kit to and from the sitters this last week and my son keeps his kit on his desk for when he has to do his summer worksheets. You can purchase Blüm online at Amazon. Blüm has given me two additional sets to give away to one lucky reader! I've also joined LeahSay’s Views and Planet Weidknecht's annual back to school hop! After you've entered here, hop around to the other bloggers listed below to see what great sweepstakes they are hosting!